Extent of regional shortening of myocardium in areas newly perfused by bypass grafting was determined in 56 patients by a new technique employing four to six radiopaque markers sutured in pairs to the epicardium near the coronary anastomosis. Paradoxical systolic expansion (PSE) was manifest in 16 regions (a 12% incidence) during the follow-up period, and six of these showed spontaneous remission. All cases of PSE were in the region of the left anterior descending artery. Correlation between graft flow measured during operation and regional shortening during the postoperative period revealed that the development of PSE could not be predicted from the hemodynamic measurements. In the majority of cases postoperative myocardial infarction could also be excluded as an explanation. At 1 year after operation most grafts were patent in PSE regions but collaterals, apparent preoperatively, could not be visualized. Excluding PSE, shortening fraction (ratio of shortening to maximum marker separation) for all graft regions at 1 week was 9.8%; 1 month, 12.8%; 3 months, 13.3%; and six months, 13.9%. Average graft flow was 56 ml. 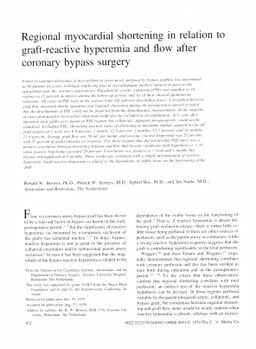 per minute and average reactive hyperemia was 25% with 37% of grafts showing no response. For those regions that did not develop PSE there was a positive correlation between shortening fraction and flow that became significant (null hypothesis: r = 0) when reactive hyperemia exceeded 20%. Correlation was greatest at 1 week and 1 month, but became nonsignificant at 6 months. These results are consistent with a simple interpretation of reactive hyperemia: Graft-reactive hyperemia is related to the dependence of viable tissue on the functioning of the graft.